Designed to check the oxidation induction time of polymers. The referred ASTM standard recommend two procedures to determine Oxidation induction time test. One is Differential Scanning Calorimeter (DSC) method & second is Differential thermal Analysis (DTA) method. • Pan: Cooling of barrel by water is provided. 500 Nos. of aluminium pans with 40 mesh screen in SS 316 will be provided as per DOT specification. Gas Regulators & Rotometers will be supplied for Nitrogen & Oxygen Gas respectively. Indium material will be supplied for Calibration of temperature.
. The display & printout of Delta Temperature Vs Time graph along with Oxidation Induction Time result is Possible through your PC. The printout includes Party's Name, address, file name, date, batch no, Operator name, Sample weight, Set temperature, Start time, Finish time, Gas flow rate etc.
. Calibration graph of melting point of indium metal along with printout facility is provided as per DOT Specification.
. Cooling System : Cooling of barrel by water is provided. 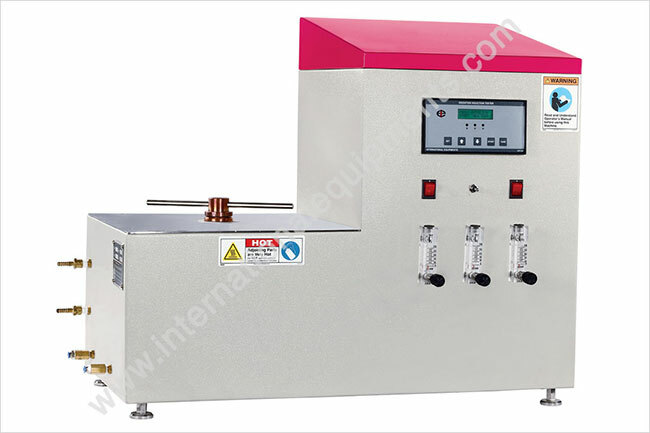 International Equipments offer Oxidation Induction test apparatus based on Differential Thermal Analysis (DTA) principle. Tests carried out with both DTA or DSC methods are similar comprising of two pans inside a thermal equilibrium zone with one reference "Empty Pan" and Second "Specimen Pan". "Oxidation Induction Time" the term itself specifys its meaning. Time required for a polymeric material to oxidise (degrade) when induced ("subjected to" or "reacted") with oxygen. Oxygen being a highly penetrating gas even polymers tend to oxidise or degrade when exposed to oxygen. Oxidation is an exothermic reaction (reaction where polymer starts throwing heat out of it before it completely degrades or oxidises. This test confirms the sustainability of any polymeric material when subjected to oxygen. Time taken for a material to degrade under specified condition of temperature (200 degree Centigrade) and certain level (80 Cubic.Centimeter) of Oxygen. This "Oxidation Induction Time Test" test requires only 8 to 10 mg of polymer mixed with antioxidants and is a very sensitive test. This test being conducted under very stringent conditions of Oxygen and Nitrogen, it is recommended to test this equipment for temperature calibration with metals like "INDIUM" having fixed melting point of 156.6 degree centigrade under inert atmosphere of Nitrogen. The same provision is offered by us in the working and construction of this equipment and its software. OIT Apparatus Equipment is known as Thermal Analyzer / OIT Machine, Differential Thermal Analyzer Apparatus, Thermal Analysis Equipment, OIT Instruments, Thermal Analyzer OIT Machine, Thermal Analysis Machine, OIT Apparatus, Thermal Analysis Products, Thermal Analysis Testing Machines, Thermal Analysis Tester, Thermal Analysis Testing, Thermal Analysis Instruments, etc.